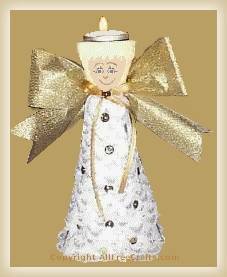 Our sweet angel will help light your way and would look lovely displayed on a side table, or somewhere near the fireplace, at Christmas time. You only need a few inexpensive supplies to complete this candle holder and, as you will see, it is quite an easy project to make. 1. Paint the clay pot in a skin tone paint color and let dry. Mix some sand with white paint to make snow paint. Use a popsicle stick to spread the snow paint over the pot as the angel’s hair, but leave an area of skin tone for the angel’s face. Let the pot dry. 2. Paint over the hair in the hair color of your choice. Copy our angel face (shown above) or paint on your own facial features. 3. Starting at the bottom of the styrofoam cone, pin the end of the ruffled lace in place and begin winding it upwards, with one row overlapping the row beneath it, until you have covered the entire cone and get to the top. Place another pin in the top to secure the top end, making sure it is on the same side as the bottom end. This will be the back of the angel. 4. Replace the two holding pins with a sequin and straight pin. Begin pinning sequins sporadically over the angel’s lace dress to decorate. 5. Glue on the angel’s head using tacky glue for a permanent bond. You might also want to use a little hot glue to get a fast bond that will hold firmly while you continue crafting. 6. Make a bow from narrow ribbon around the angel’s neck and use a pin to secure it. Fashion a big bow from the wide ribbon to make the angel’s wings; secure with glue. Optional: I didn’t spray a sealer on the painted pot, but it would be a good idea for long-term storage. If you like, cut a circle of white felt to fit the bottom of the styrofoam cone and glue in place to finish. I think this angel candle holder will make a very nice gift. Add her to a basket with some candles and a box of candle matches. Enjoy!